By Simon Johnson. This material was prepared as part of the New York Times’ Room for Debate on “Should Mega-Banks Be Broken Apart“? I strongly recommend the post by Anat Admati. But the Dodd-Frank financial reform legislation does not create a “resolution mechanism” that can deal with cross-border megabanks; this point is admitted by all involved. And there is nothing in the G20 process or underway with any other international forum that would make a difference in this regard. So when very big banks are on the brink of failure, the Obama administration and Congress will have to face this choice: either let this big bank go through bankruptcy, like Lehman Brothers, or provide it with a bailout — meaning complete protection for all creditors (but hope you can at least remove some management this time around). Unfortunately, the Irish experience shows that the “let’s do an unsavory bailout” will like not end well next time. Our megabanks are getting bigger — as we demonstrated in 13 Bankers and as Thomas Hoenig argued in the Times last week — not because of any kind of legitimate market process, but because they benefit from an unfair and non-transparent government subsidy. And these big banks have recklessly dangerous levels of debt relative to equity, as Anat Admati and her colleagues have pointed out. Put simply, by allowing our biggest banks to become even bigger — and more leveraged — the government is taking on a large contingent fiscal liability. Whatever you think of current fiscal policy — and whatever the outcome of the current debate over taxes and spending in the U.S. — remember this: by all standard balance sheet measures, Ireland was running responsible fiscal policy over the past decade. But the implicit liabilities of the Irish state were ballooning out of control, in direct proportion to the size of the biggest Irish banks. Three banks failed and this has taken down the entire Irish economy. There are no economies of scale or scope in banking over about $100 billion in assets. Bankers, like Jamie Dimon, make claims to the contrary — including in an interview published in the New York Times on Sunday. But they do not have a single piece of evidence that society gains from having megabanks at today’s scale and with today’s leverage. Our biggest banks are already subject to a partial size cap. According to the Riegle-Neal Act of 1994, no one bank can have more than 10 percent of total retail deposits in the United States. Unfortunately, the growth of wholesale financing and the global spread of these banks essentially made a mockery of this sensible macroprudential regulation. We should update and apply the Riegle-Neal Act, exactly as proposed by Senators Sherrod Brown and Ted Kaufman in spring 2010. If you would like to reproduce this entire post, please contact the New York Times. This entry was posted in Commentary and tagged megabanks, NYT room for debate. Bookmark the permalink. Part of a solution would be to require that transactions over a certain size be required to be jointly underwritten by a number of financial institutions. This spreading of risk might prevent risk of a single or few transactions taking down a bank. Investment banks, when they were partnerships, had to do joint underwriting to issue corporate stock issues. How about looking at joint underwriting for large transactions and mandatory risk spreading. But they do not have a single piece of evidence that society gains from having megabanks at today’s scale and with today’s leverage. But of course they do! Bigger banks make bigger profits, and since markets are 100% efficient, that implies they provide bigger benefits to society. Q.E.D. Why, JP Morgan alone created almost $9 billion in value last year. Can’t you tell? I doubt that the economies of scale in banking (1) are so well known that claims can be made on the basis of a single figure (USD 100 bn) (2) that they are static (very large banks have had only little time to develop in the US and the largest ones are probably still far from the optimal cost curve in the businesses they are in (3) that asset size as such has much to to with the sort of externalities that are popularly known as too big to fail. Not that I think outfits like JPM are more desirable than smaller ones of course, the JPMs of this world have managed to reach a size AND scope (1) that makes it very difficult to manage them (2) that warrants a special “provision” on the part of the “sponsoring” state to cover the contingent costs associated with this thing having this type of destructive potential. It is a bit like a nuclear power station: less likely to break down than an old coal fired plant, but if it does, far more dangerous. The point is: who pays for that and how: in advance or in arrears? One would expect that if claims on the part of management that shareholders, creditors etc should suffer under certain circumstances, were believed by the market, very few would entrust the sort of value to JPM (in it’s many roles) for the same price as they do now, because pricing a low-probability/high-severity risk is difficult and especially so for the average risk averse creditor. If regulators structured the financial services industry in such a way that creditors had the choice between (a) a very large and very opaque but credibly uninsured JPM (as Mr Dimon seems to suggest would be his preferred position) and (b) a much more deliberately transparent special purpose but equally credibly uninsured commercial bank (assuming entrepreneurs would develop/redevelop banks to be just that if that was what it would take to have a franchise, access to the payments system and access to FDIC insurance on part of the liabilities) and (c) a well diversified money- market fund, JPM would be the last choice. As it stands now, JPM could give you each of those: it could act as principal and trumpet the credibility of it’s uninsuredness, set up a special purpose bank at arm’s length, and manage a moneymarket fund. Which of these ones would be the least attractive from a shareholder value perspective. But there is no way to achieve the world envisaged in the previous para, so let us hope mr Dimon is as competent as he sounds. I understand one of your points about Ireland to mean, by implication, that the September 2008 decision to give an unrestricted guarantee of bank liabilities was not much more than a detail: the failure of the three banks would have “taken down the entire Irish economy” anyway. These banks had already failed in a material sense. What was missing was injury to their creditors. To what extent that injury would be against Irish interests is the real issue. Maybe the response of the injured would have been damaging to Irsh public interest, maybe only to a definable group. But this was one of the most stupid things that ever happened in Europe. An Ireland damaged by doing the right thing (+protecting the credibility of the ECB) should have been assisted. The rescue that happens now is (a) for the Irish people apparently more of a way to save German interests (which may be quite false, no one in the public knows precisely who holds Irish debt vulnerable to the absence of a bail-out) and (b) something that resuscitates the false notion of the no-bailout clause in the CBD arrangements being untrue. There may be people who believe that deficit spending in a very large economy like the EUR regio will have positive”Keynesian” effects in a situation like the present. That is nonsense “keynesian ” policies are an excuse for vote-buying. As Keynes himself noted, traditional means of dealing with the business would be unfeasible in societies with universal suffrage. Well, as it happens, publics are rational enough to accept spending cuts. What they do not l;ike is tax increases. It is well known that shortly before The Great Depression the one investment you should not have been in was as a creditor. For when the masses could no longer pay their obligations, they were the ones to lose money. The debtor was essentially given free money and then had none during the depression. Todays situtation is much worse, hence the inflate your way out policy. But we are a slip of the trigger from a reoccurance to sky high gold and sky high oil, at the same time. Keep up the good work Mr. Johnson, making practical solutions about how to solve the power of the megabanks over the people by good legislation and regulation. I usually read your articles as they are proving to be very insightful and always ahead of the curve. I would like to thank you for sharing your expertise with us at no cost and with no hidden interests. I think one of the great advantages about the current times we live in is that we can have access to and share information with some extremely educated and smart people. Also that our news is not just from media which is normally controlled by the elite of a particular country. Seems that all that we’ve done to salvage our financial system has not solved the failure of the system. Salvaging is different from solving. The Economics of Contempt blog has a great idea for those who violate the Volcker rule – limit their pay to $100,000. No bonuses. Bankers who claim the big banks are essential for a global economy need to be held accountable for their actions. When the global economy crashes due to the failures of these banks, the pay and bonuses of their executives should crash just as precipitously. In other words, those whose business practices lead to failure should be held accountable, not given bonuses. What if we introduced a progressive tax on financial institutions? Would that work to put a maximum limit on the size they could reach? So the US Govt holds the downside on the largest banks (we also hold the downside on smaller banks, but that’s another issue). So we are either shareholders or an insurer. We could force banks to issue stock to the US Gov to reflect this shareholder role, or we could charge rates for the insurance provided that is commensurate with the risk. FDIC could adopt a progressive insurance rate, where the largest banks pay the highest rates, based on total assets, not just deposits. That would set up a nice game of chicken. Take the FDIC guarantee away, retail deposits go away, and the value of their retail networks goes to near zero. Using the FDIC is a dangerous idea because the FDIC had the brilliant idea to stop collecting premiums during good times. What type of insurance company does that??? Taxing, are u kidding… they’ve already tried that: taxing bonuses as income, failed; tried taxing derivatives earnings, failed; tried supporting a stand-alone ‘tax break’ for the truly needed (refer to yesterday’s press conference by Pres Obama); failed. Senator Bernie Saunders may filibuster the Bush-era tax cuts but I would not be too hopeful. After dooms day, then what….. The other thing you could do is have more regulators assigned to more frequent audit of large institutions, and bill the cost to the bank. These measures would be justified by the fact that small banks have simple resolution mechanisms, while larger ones do not. The larger the bank, the more difficult the resolution, the higher the cost to insure. In a global-fiat-financial system, the demand for cross-border capital is compromised by the ease in which capital is created. So the problem is not just that some banks have become too large, it is that demand for exogenous investment capital is diminishing as an ever increasing number of nations develop their own lending capacities. Nations simply have no reason to allow usury from outside of their borders in a system that has only risk pricing as a constraint on the creation of capital. What we are most likely experiencing now are the nascent stages of a new era made necessary by the evolution of the global financial system. It seems we have a choice between continuing to believe that wealth itself has more value than it actually does as investment capital, or… freeing ourselves from the long standing tyranny of plutocrats. The hard way, or the easy way? And it can all be improved with nothing more than understanding, and… the financial system itself is trying to show us the way. Nations simply have no reason to allow usury from outside of their borders in a system that has only risk pricing as a constraint on the creation of capital. What about the mostly illegal underground economy? It simply crosses borders without risk. can you hear the trillionnaires LAUGHING at “how stupid the FBI is…? That’s how what you believe and celebrate can kill ya – 2000 years of BELIEVING that killing someone like Jesus sets you free from “sin”…rich, ain’t it? PS. Always keeping a light on for ya Annie – meanwhile, I’ll keep my stick on the ice,…at the camp? Before worrying about breaking up megabanks, take away their growth-hormones. Bank Regulation 101: When regulators allow some banks to leverage their capital more than others just because they are larger (Basel II Internal Ratings-Based Approach for Credit Risk), then by definition these already large banks will grow larger and the rest of the banks will become feeders of bank operations to the large… for the simple reason that if any bank held an asset that carried higher capital requirements than if held elsewhere, that would be inefficient… and markets hate those inefficiencies. You want to correct for that? Then see to that the large banks have slightly higher capital requirements than the small banks… and which makes sense since when the large fall on you it might hurt a lot more. This is a good point. 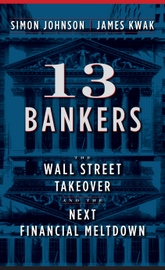 The main banks that provide the credit default swaps for bondholders include bank of america, goldman sachs, jpmorgan. It actually doesnt make sense that they make a premium for CDS which is basically an insurance premium for the bondholders. They actually do not have the ability to insure the bondholders, see AIG and lehman, so the government is the insurer. They gave 180billion to AIG. So of course the government should be getting the premiums for the CDS or just utlaw them. And that is not even half the story or would not even be half the bad, if the capital requirements on all lending were equal… but, as is, with ultra low capital requirements when lending to what is perceived as low risk, the expected profits when lending to the triple-As, Greece or Irish banks became ultra high when compared to the returns on capital banks should normally obtain from lending to the risky small businesses and entrepreneurs. In other words: End the Fed and other mega banks. There is no more need for them than the plague or cancer.